AD 73 is a bastion of conservatism, and it will be a safe Republican seat in both the June and November election for Assemblywoman Harkey. Dave Duringer– He is a gun trust attorney who I believe is involved in the tea party (not 100% sure on that. 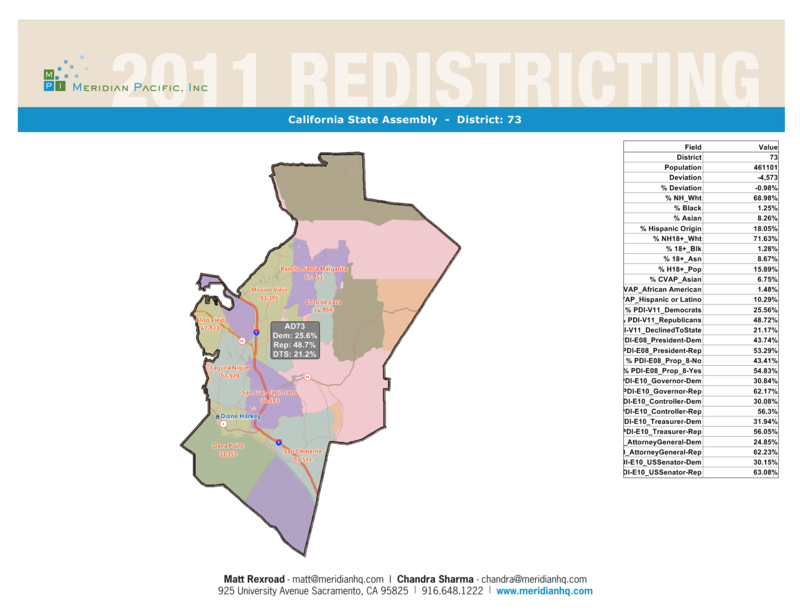 He also ran for the Central Committee back in 2010 prior to redistricting when his district was the 71st. Mary Young– She has been an activist with the Republican Party of Orange County for a very long time. She is also campaigning the hardest of anybody I have ever seen for a Central Committee seat. *Incumbent. Mike Munzing– He was at one point running against John Campbell for Congress and then wisely decided to run for Aliso Viejo City Council. He is very good at marketing himself from what I have witnessed through his many activities. *Incumbent. Alice Anderson– She is currently an incumbent in this district. I would encourage those involved in OCGOP politics to seek out a way to sign her nomination papers if you live in this district. *Incumbent. Norm Dickinson– Many people who I have talked to have said that he is the foremost expert on the bylaws in the Republican Party of Orange County. I cannot see that I disagree from what I have witnessed. *Incumbent. Steve Magdziak– He is one of the few that has set up a website for his Central Committee race http://www.stevemagdziak.com/ His website does not include much information about his background but if I had to guess I would think he was part of the Ron Paul crowd. Chandra Chell– She is active in Republican politics through Atlas PAC among other things and she has also been involved in the CRA among other Republican volunteer organizations. *Incumbent. Linda Barnes– From a bit of research I have learned that she is part of the leadership team with OC912 a conservative group which is tied to the tea party. Greg Woodard– He recently friended me on Facebook. After having a conversation with him I found that he is involved in a lot of conservative groups including Atlas PAC and Family Action PAC. He was also appointed to a seat on the OC GOP Central Committee making him an incumbent as well. *Incumbent. Nancy Padberg– She was previously on the Central Committee but was one of the members that was ousted in this past election. As an elected official on the South Orange County Community College District, her name ID will be high. Tony Beall– He currently is an incumbent on both the Central Committee and on the Rancho Santa Margarita City Council. He also has been a conservative voice on the issues involving the Capistrano Unified School District. *Incumbent. Kevin Richardson– According to the very little that I could find out about him he is one of the co-founders of SOC912 which I referenced above (OC912). Nina R. Davar– I am seeing a trend here as when I did a bit of googling I found her name attached to SOC912 as well as other candidates with tea party ties. John C. Drew– A writer for Examiner.com on Republican Party of Orange County Republican politics. He had a lot of information on his bio including the fact that he is an award-winning political scientist. Susan A. Bock– I was unable to find any information on her. Nesa Anderson– She is a Planning Commissioner/Businesswoman from what I believe is San Clemente. She also won the lottery to appear first on the ballot. Evan P. Chafee– He will appear on the ballot as a Marketing Sales Representative. All I could find about him is that he is from San Juan Capistrano. Mark Dobrilovic– He is an activist that I have heard about tat runs in the Tea Party circles. He also ran for Mission Viejo City Council in 2010. Jon Steven Fleischman– He is a major player in Republican Party Politics and he runs te popular Flash Report website. I definitely see him winning one of the 6 available seats. Roy Fussell– A Realtor who is running, I was unable to find much more information. Paul Hebbard– He is listed on the ballot as a Certified Public Accountant and outside of that I know very little. Michael Kogus– He is listed on the ballot as a Business Owner, but like some of the other challengers I was unable to find any information on him. Erik Stolaski– He is a Tea Party Republican who I believe worked on the Nelson for Supervisor campaign if I recall correctly. 5. Greg Woodard Jon Steven Fleischman This was a mistake on my part when writing the post. My apologies to Greg Woodard who is a really nice guy and a very solid Republican. This entry was posted on April 25, 2012 at 10:03 AM	and is filed under Republican Central Committee. Tagged: Alice Anderson, Chandra Chell, Dave Duringer, Eric Stolaski, Evan P. Chafee, Greg Woodard, John C. Drew, Jon Steven Fleischman, Kevin Richardson, Linda Barnes, Mark Dobrilovic, Mary Young, Michael Kogus, Mike Munzing, Nancy Padberg, Nesa Anderson, Nina R. Davar, Norm Dickinson, Paul Hebbard, Steve Magdziak, Susan A. Bock, Tony Ball. You can follow any responses to this entry through the RSS 2.0 feed. You can leave a response, or trackback from your own site. He was recently endorsed by Lincoln Club of Orange County! As you may know, my friends and I are running on a slate of candidates committed to constitutional conservative philosophy. We are motivated, in part, by the disappointment we felt when so many folks on the Republican Central Committee – including Jon Fleishman and Mary Young – voted to endorse Rep. John Campbell despite his out-of-step votes on DADT and TARP. Our slate includes Republicans who are much closer to the mainstream in our community such as John Drew, Nina Davar, Kevin Richardson, Dave Duringer and Steve Magdziak.